Double Serum. Two power-packed serums in one! 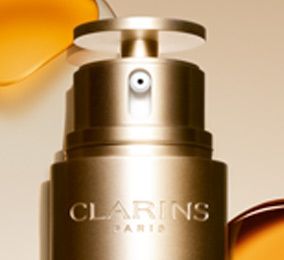 Clarins’ innovative dual-phase technology successfully combines 1 2 potent anti-ageing plant extracts—both water- and oil-soluble—to assure a perfect affinity with your skin, speedy absorption, and a perfectly sheer result. Discover the Double Serum Application Method—Clarins’ hands-on way to enhance the benefits of this unrivaled anti-ageing treatment.